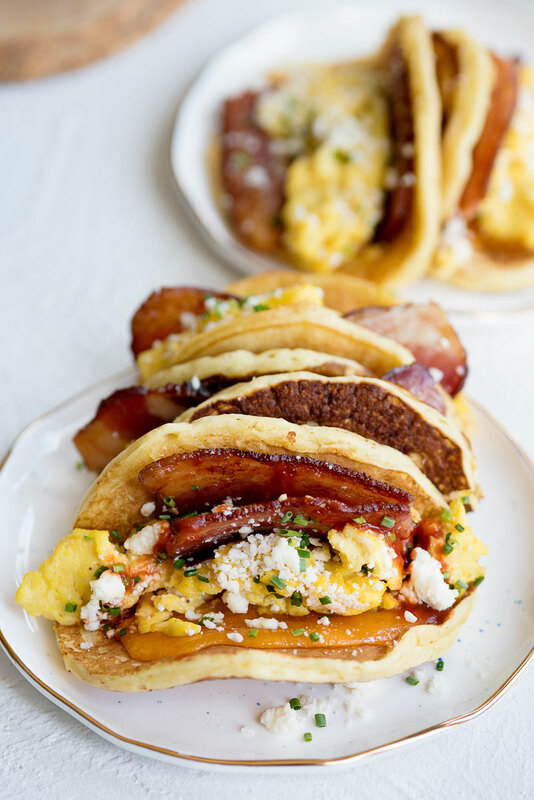 Basically the best breakfast recipe ever – breakfast tacos with bacon, eggs and cheese, and a PANCAKE taco shell! Easy to follow recipe and video. 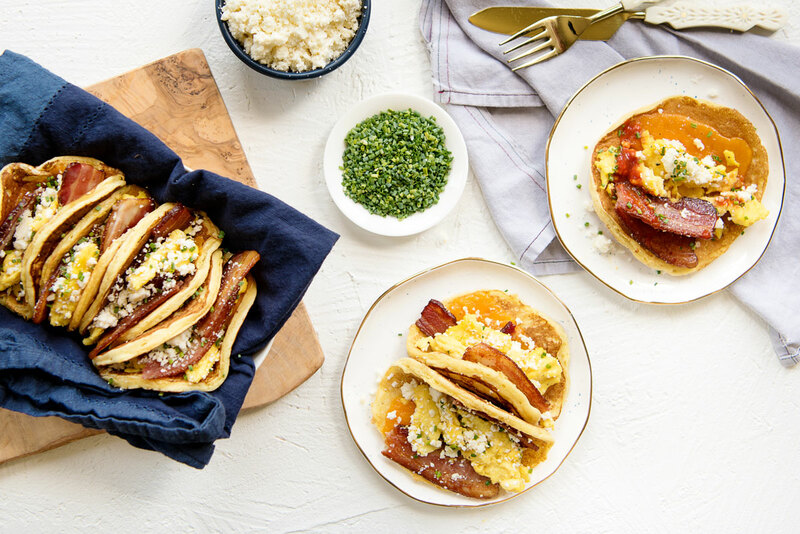 My newest breakfast obsession is these breakfast tacos that are made with all of my favorite breakfast foods – bacon, eggs, cheese, and more cheese! 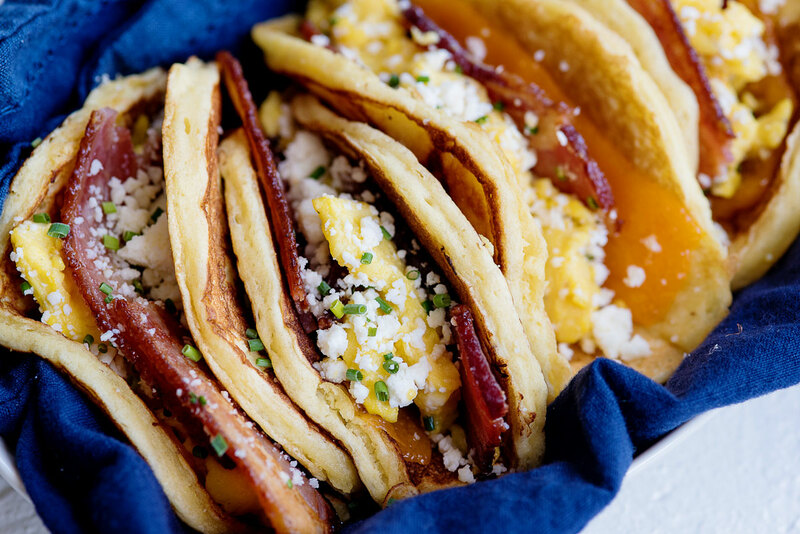 The thing that really sets them apart though is they have a pancake taco shell instead of a regular shell! Genius right? 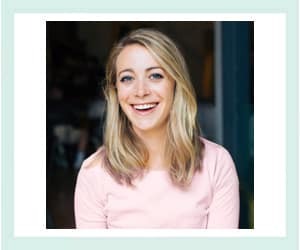 Click through for the recipe and check out the accompanying video on my YouTube channel! 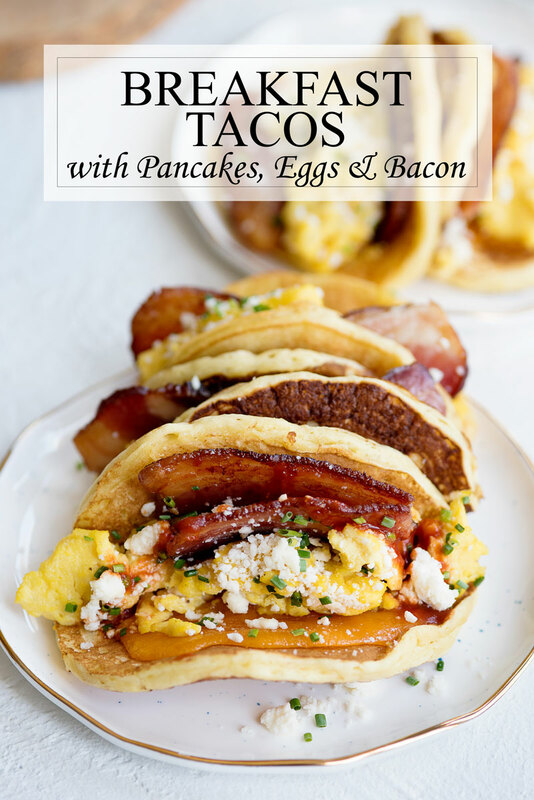 This recipe makes a great group brunch recipe as it’s almost as fun to make as it is to eat! I also love that the bacon is made in the oven and not in a pan as it guarantees perfectly flat slices every time. I recently switched to doing this for most of my bacon recipes and I’m loving the results. If you’ve never heard of cojita cheese, it’s a Mexican hard cow’s milk cheese that has a strong salty flavor that makes me think of feta cheese. If you can’t find it where you live, feta is a great substitute. Seriously though, check out the video and while you’re at it, don’t forget to subscribe to my YouTube channel! 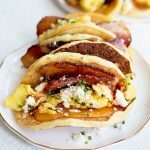 Basically the best breakfast recipe ever – breakfast tacos with bacon, eggs and cheese and a PANCAKE taco shell! Easy to follow recipe and video. In a separate bowl, whisk together buttermilk, milk, eggs and melted butter. Pour wet ingredients into dry ingredients and whisk with a fork until just combined. Do not over mix. Heat a lightly oiled griddle or saucepan over medium high heat. Scoop approximately 1/2 cup of batter onto the griddle and cook on both sides for 2-3 minutes. Place on a plate and keep in a warmed oven until ready to assemble tacos. Place the pancakes on parchment paper-lined baking sheets. Top with slices of cheddar cheese. Place the bacon on a tinfoil-lined baking sheet and bake until crisp, 15 to 17 minutes. Five minutes before bacon is done, put the pancakes in the oven to allow the cheese to melt. Meanwhile, heat the butter in a large skillet over medium heat. Add the whisked eggs and scramble for 3 to 4 minutes. Season with salt and pepper. Fill each pancake with a scoop of scrambled eggs and a piece of bacon cut in half. Garnish with feta, chives and hot sauce (optional). Serve immediately.